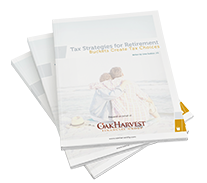 The Oak Harvest Way is the firm's approach to retirement planning, investment management and the process of partnering with a firm that focuses on putting you first. Oak Harvest promises transparency and integrity in all dealings. At Oak Harvest, you will find professionals who place principles and values above profits. Our clients are our priority. Our investment advisors are fiduciaries, not brokers. Unlike brokers, fiduciaries have a legal responsibility to always put their clients first. We strive to provide value beyond expectation to our clients, employees, partners and vendors. All Oak Harvest fees are transparent and itemized on your monthly reports. We operate independently; we avoid and/or disclose any potential conflict of interest. Oak Harvest Professionals always seek to provide our services in a fair, honest and transparent manner, the way we believe they should be provided. This is the Oak Harvest Way.